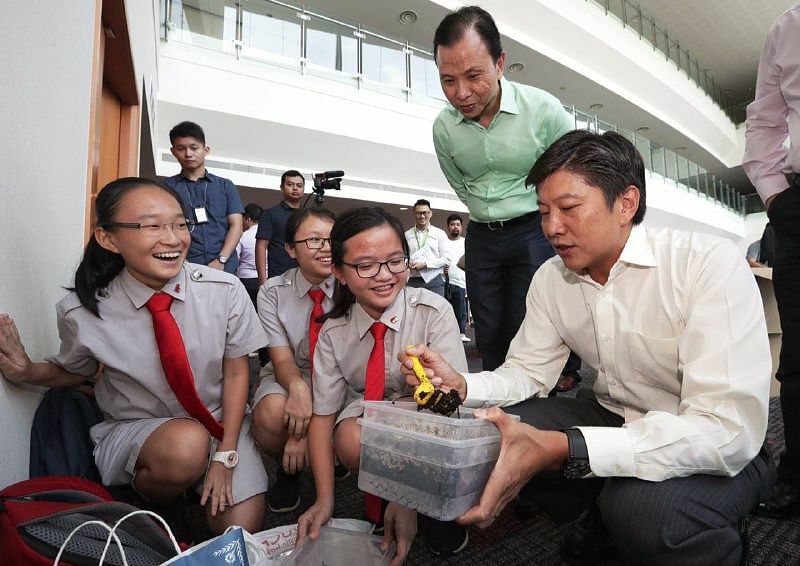 SINGAPORE - Students at National Junior College have been using worms to reduce food waste produced in their school. Tucked in a corner of the school are worm factories where the creatures are grown and then mobilised to turn food waste into fertiliser, through a process called vermicomposting. The factories are each about 1m tall and hold three levels each of soil, coco peat and 300 to 400 worms. Food waste like egg shells, vegetable scraps and coffee grounds are blended and dumped into the factories for the worms to consume and digest, which they complete in one week. After water is poured into the factories at the end of every week, the liquid that drains out is then used to fertilise the school's garden. The students have even taken their knowledge to residents at the nearby Watten Estate to show them how they can create their own worm factories as well. "I feel a sense of accomplishment seeing the residents take the worm factories home to continue with their effort," said Secondary 3 student Xie Wanxin, 15. Students Xie Wanxin, Jacqueline Tan and Vanessa Chan explain what a worm factory is. "Some plants in our gardens flowered for the first time after we watered them with the fertiliser, or 'worm tea'," she added. For their efforts in promoting conservation and recycling, the students were recognised at the Singapore Environment Council-StarHub School Green Awards (SGA) held on Wednesday (Nov 8) at ITE College East, along with six other schools. The other schools are: PCF Sparkletots Preschool @ Pioneer Blk 661B, Xinghua Primary School, Anderson Secondary School, Ngee Ann Polytechnic, Tanglin Trust School and MINDS Woodlands Gardens School. The seven schools received the Outstanding Environmental Outreach Project Award - the top award. The SGA is a self-audited voluntary environmental programme which allows students to develop and showcase their environmental efforts. Tan Hong Yi and Kashvi Raghavendra tells ST how to make "magic cleaners"
"They are very good for cleaning glass, plastic. My parents use it to clean our table at home," said Primary 3 pupil Tan Hong Yi, nine. This year, a record 410 schools and their students took the message about conservation and recycling into the community. More than 28 per cent were pre-schools. Through their initiatives, the students saved 5,252,000 kilowatt hours of energy, enough to power 1,094 four-room HDB flats for a year. They also saved 130,000,000 litres of water, enough to fill 52 Olympic-sized swimming pools, and collected 47,362kg of electric and electronic waste for recycling - the weight of five buses.